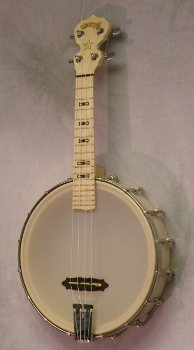 This is one incredible banjo uke! It is 100% USA made and features a 3 ply violin grade maple rim, a maple neck with bow tie hardwood inlays, an extended fingerboard, an 11" renaissance head, and cast metal brackets. Most banjo ukes leave much to be desired in the realm of sound, playability, and proper intonation whereas this little fella has got all 3! Includes a nice deering gigbag.